(Asheville,NC) – Green Man Brewery, out of Asheville, NC has added a fourth state to their distribution footprint, launching in Daytona and Ormund Beach. The addition of Florida brings Green Man to distribution in four states in the Southeast, along with North Carolina, South Carolina, and Tennessee. Green Man IPA: Green Man India Pale Ale is delectably hoppy with a properly balanced body. Generous hop additions give it a wonderful bitterness and pleasant floral nose, while our combination of traditional British malts creates a rich, satisfying flavor and alluring copper color. Green Man ESB: A malty amber ale boasting rich toasted and caramel flavors, Green Man ESB is one of our award-winning signature brews. Our blend of authentic British malts and hops creates a nutty aroma, full body, and a sweet finish. Prepare yourself for a truly exceptional interpretation of a traditional English style. Green Man Porter: Dark, full-bodied, and rich in flavor, Green Man Porter is wonderfully easy to drink. It offers a creamy, smooth mouthfeel and finishes with distinctive chocolate notes. This traditionally crafted, award-winning British-style Porter, like a true rock star, enjoys a legendary following. Green Man Harvester: Harvester is our interpretation of the classic German Marzen style. Magnum and Palisade highlight a creative hop blend. The result is a deep amber color and a hearty flavor that salutes the old world taste of the season. “There has been a huge pull of demand for Green Man down in Florida, and we are excited for our fans to have access to our beer close to home,” says PR Manager Elise Carlson. Green Man has partnered with S.R. Perrott Inc. to debut their Legendary Ales in Florida and will continue to expand distribution throughout the Southeast. 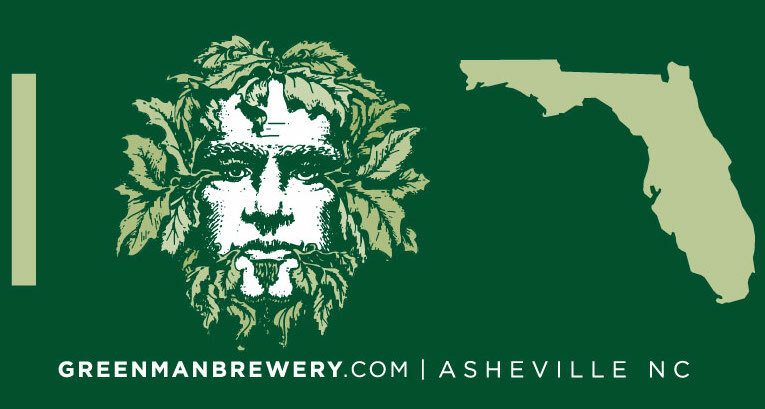 The legendary Green Man has existed for centuries but it’s no myth that he’s been brewing great beer in Asheville since 1997. Green Man has been producing some of the beer scene’s most iconic ales for 18 years, which are recognized for quality and consistency.